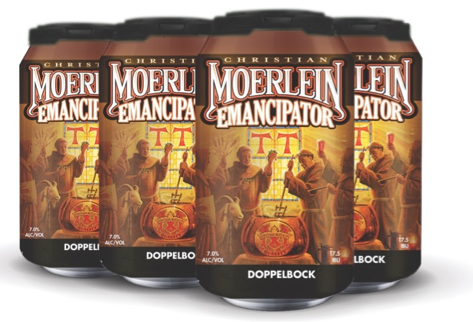 Christian Moerlein Brewing Co. is gearing up for the Bockfest season with the official seasonal release of their Emancipator Doppelbock. On Friday January 12, 2018, Bock Beer lovers can stop by the Christian Moerlein Malt House Taproom (1621 Moore Street, Cincinnati, OH 45202) for their first Emancipator pint of the season. Consumers will also be able to take home the Doppelbock in 6 pack 12 oz. cans. Alongside the beers debut, Christian Moerlein will be continuing the tradition of the ceremonial keg tapping and Emancipator blessing done by the brewery’s neighbors of St. Francis Seraph Church. The beer will be released at 4 PM when the Taproom opens, but the official blessing will take place at 7 p.m. with the keg tapping to follow. Doppelbock was first brewed in Munich by the Franciscan Hermits of Paula in Munich Germany in 1634. Doppelbock, meaning “double bock,” is a higher alcohol version of the traditional bock. This beer served as "liquid bread" during fasting, when food was not permitted in the era. Christian Moerlein’s Emancipator Doppelbock comes in at 7% ABV and 17.5 IBU, and is a tribute to the original Franciscan Hermits and the brewery's neighbors the Franciscan Friars of the Province of St. John the Baptist, serving at St. Francis Seraph and throughout the Midwest. After the Taproom release, Emancipator Doppelbock will be available throughout the market and can be enjoyed at this year’s Bockfest, March 2-4, 2018 at the Christian Moerlein Brewery & Taproom in Over-the-Rhine.